In Lagado: “We next went to the school of languages, where three professors sat in consultation upon improving that of their own country. The first project was to shorten discourse by cutting polysyllables into one, and leaving out verbs and participles, because in reality all things imaginable are but nouns. And how did Gulliver aka Swift know that more than two-hundred years later, I would be packing useless words on my back, hauling them about with me to unpack here and there for conversation pieces–or stories. My back aches with words, or the lack of them. It’s time to unpack. The New Year calls for it. I will therefore unpack my words for a few days, live up the New Year with my beautiful family–drink wine and listen to accordions. I will make no plans or promises, except I will pray and give my load of bagged words over to God. I’m in a mood for humor, after a late night and an early morning. Last night we went to see Enter the Haggis, a Celtic rock band from Canada. As I’ve mentioned before, much of my life revolves around Irish dancing, and last night was no different. The band had invited the local Irish dancers to perform on stage during the concert, so that’s where my daughters were: on stage dancing a few numbers with a great band. It was fun, but we are all exhausted this morning. This whole lack of sleep thing doesn’t really suit me. It’s how I live my life, though. And all of this has absolutely nothing to do with the subject of my post. If you recall, last week I posted part of Jonathan Swift’s The Lady’s Dressing Room. It is a gross, yet funny poem mocking lovers’ illusions and pastorals and vain women. Swift is known for penning gross poetry that deals with subjects such as excrement. Many of his political essays are not only gross, but shocking. For example, his Modest Proposal suggests that the Irish solve their problems of poverty and hunger by selling their own children for food. 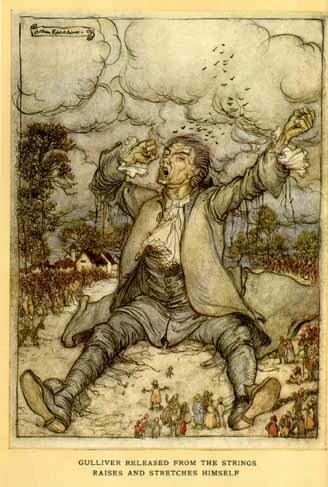 What you may not realize when you think about the author of Gulliver’s Travels is his career as a clergyman. When Lady Mary Wortley Montagu wrote her poem, The Reasons That Induced Dr. Swift to Write a Poem Called the Lady’s Dressing Room*, she held his position firmly in mind. She might as well have titled her poem Why Would a Clergyman Write Such Filth? For that, she has the Doctor (Swift) visiting a prostitute, and then demanding his money back from her because he can’t . . . well, you know, finish the dirty deed. I will post the last stanza, which is a conversation between Dr. Swift and the prostitute, because it is not only funny, but biting in its tone. The nymph grown furious roared, “By God! But nothing done, I’ll nothing pay. “Would you palm such a cheat on me! My guess is that Lady Mary didn’t like Dr. Swift all that much, nor did she appreciate his satire. Arrayed in lace, brocade, and tissues. Soon punished Strephon for his peeping. Swift was such a funny man, and to be honest, it wasn’t solely the woman who was his object of scorn, here. Who was the greater fool? Was it the woman for putting on a display, or the man for being fooled by it? Next week I’ll post a lady’s response to Swift’s gross tetrametrical couplets. I mean, really, an intelligent woman might well ask, would Dr. Swift bother to write over 140 lines describing the filth in a lady’s dressing room?